Why are Arctic animals like they are? FieldWorking together: anthropologists and geneticists search for an answer. 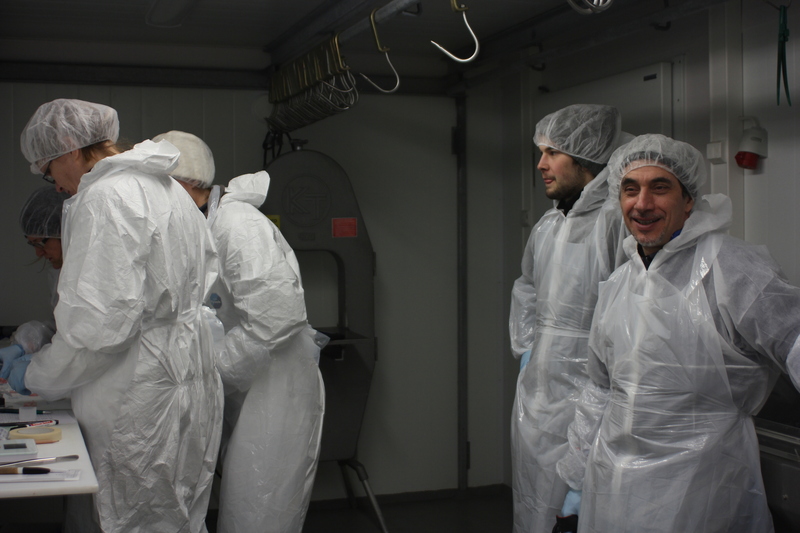 The joint field trip to a reindeer farm in Finland in April was the first experience of a collaborative work of social and natural scientists to understand processes of animal adaptation to extreme Arctic environments. The ‘Arctic Ark’ project (Arctic Ark. Human-animal adaptation to the Arctic environment: natural and folk selection practices, 2015-2018) consists of two distinct but integrated parts. Natural scientists are dealing with the detailed animal biological genome to get more insights about nature evolution. Changes in physiology and metabolism here are crucial to adapt to annually changing, specific vegetation and cold temperature. Comparison with the samples from other animals and regions can greatly contribute to better understanding of adaptive processes in the North. Anthropologists focus on local knowledge and practices related to selective breeding and desired use of animals. Slaughtering is part of reindeer breeding and it was a good occasion for us to learn more about selective choices of reindeer herders – why were these particular animals selected? 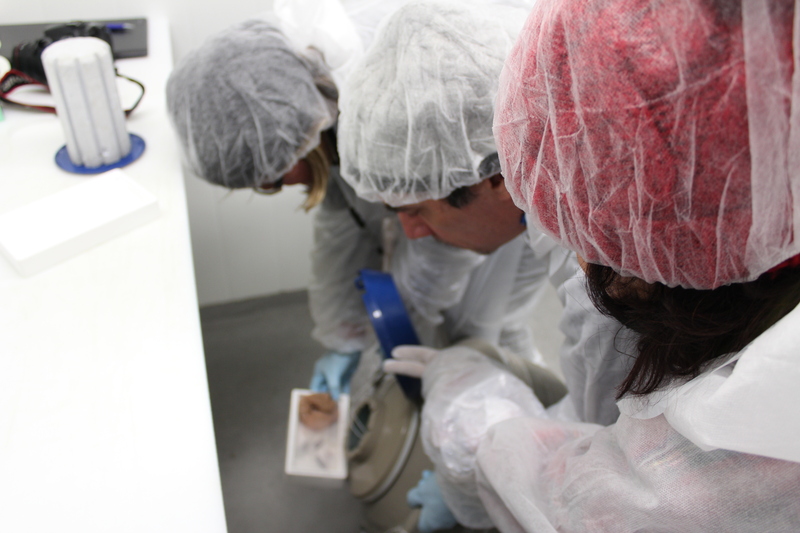 Anyway, we anthropologists (Nuccio Mazzullo and me) and our master student Leon Fuchs, without any previous experience of sampling, learned a lot about sophisticated methods of collecting tissues and contributed as much as we could to the samples preservation by our colleagues, at least holding the lid of nitrogen container or labeling glass tubes. Joining the reindeer feeding was for the anthropologists a great possibility to get insights about the different activities needed to keep animals healthy and to learn more about the concept of the ‘beautiful herd’. “In wintertime, reindeer are kept together in a large outdoor enclosure. The herder mainly feeds them with artificial food. To do this, he uses his snowmobile and pulls a trailer loaded with granules into the forest. 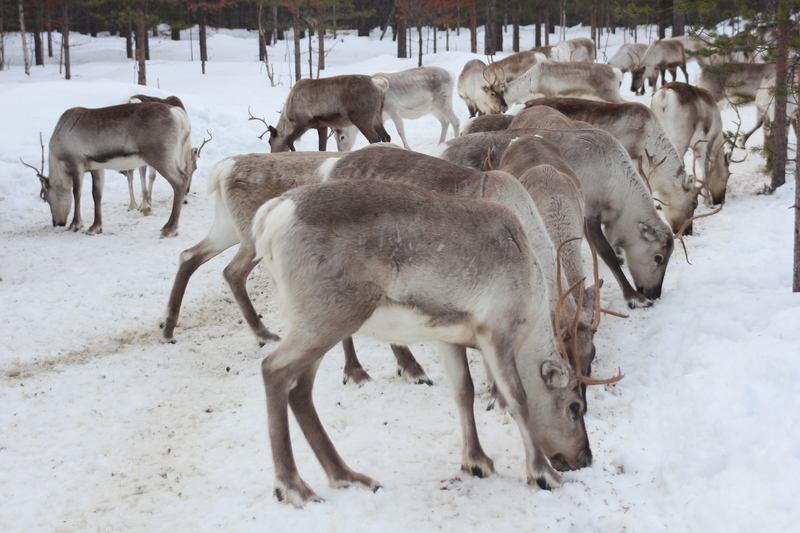 Once in the enclosed area, reindeer follow the snowmobile and run around the herder. They seem to know what is going on and they appear to be quite used to the process. The trailer is designed in a way that the food is spread throughout the pen in a sufficiently fair manner for every reindeer, and the animals align themselves to get food in a straight line. After only a few minutes, the food is all gone and reindeer go a bit further away in the forest. While feeding the animals, the herder also talked about the colors of reindeer, their antlers and health issues. Besides, he showed us some particular trees and explained that he sometimes cuts branches to feed reindeer and clean the forest”. This entry was posted in Announcements, Arctic Ark: Human-animal relations, Fieldwork. Bookmark the permalink.